Conceptualizing, mapping and analyzing trust between regulators, regulatees and citizens, expert contributors systematically review the existing empirical research on the role of trust within these relations. Further chapters offer new empirical material, with case studies covering different regulatory relations, regulatory issues and geographical areas. 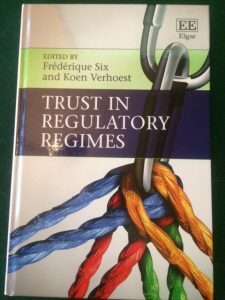 After scoping the field of inquiry and significantly adding to it, the book concludes with a proposal for a challenging and encompassing agenda for future research on trust in regulatory governance. Comprehensive and forward thinking, this book will be of interest to academics working in the fields of regulation, sociology, law, political science, public administration and trust. It will also offer a compelling read for practitioners working in the field of regulation.